Kopp Development Inc., the leading manufacturer of ferromagnetic detectors for MRI Safety, FerrAlert™, is proud to announce the most comprehensive safety solution, FerrAlert™ Encompass. It is the only system that provides a photographic stream and does not require manual logging, allowing the technologists to perform uninterrupted patient care without wasting time with self-reporting. The data analysis software allows for effortless generation of reports for The Joint Commission inspections. 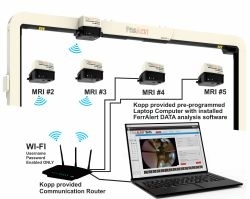 Jensen Beach, FL, March 27, 2019 --(PR.com)-- Kopp Development Inc., the leading manufacturer of ferromagnetic detectors for MRI Safety, FerrAlert™, is proud to announce the most comprehensive safety solution, FerrAlert™ Encompass. This combination of multiple products automatically detects and logs unintended ferromagnetic objects entering Zone IV. It is the only system that provides a photographic stream and does not require manual logging, allowing the technologists to perform uninterrupted patient care without wasting time with self-reporting. The data analysis software allows for effortless generation of reports for The Joint Commission inspections. It also allows for analysis of safety trends that can be shared throughout the entire hospital system. All FerrAlert™ products are regarded as the most accurate and reliable systems on the market, due to their unique, patented technology to detect and precisely locate offending ferrous objects. This timesaving feature makes them the preferred choice by hospitals and imaging centers worldwide. In the “Revised Requirements for Diagnostic Imaging Services” that took effect on July 1st, 2015, The Joint Commission recognizes the need for documenting ferromagnetic materials entering Zone IV (the MRI scanner room). To assist MRI providers with The Joint Commission compliance, Kopp Development realized that an automatic method of documenting ferromagnetic incidents is needed. This method must allow for independent documentation and analysis of an incident and provide an unbiased photographic log to facilitate corrective actions. The logging and report generating features of FerrAlert™ Encompass have been specifically created to help MRI providers to comply with The Joint Commission requirements. In addition, it is a great tool to assist with internal Root Case Analyses. One of the exclusive features of the FerrAlert™ Encompass is a photographic log which allows “consistent and accurate reporting,” per the above statement. “We are thrilled by the responses we are getting from MRI providers. I am very proud of our engineering and design teams for coming up with such outstanding systems that help MRI providers to increase their safety protocols, as well as to comply with The Joint Commission and to assist with Root Cause Analyses,” says the company’s Founder and President, Keith Kopp. Click here to view the list of recent Press Releases from Kopp Development Inc.